Nev shows up at Pitches a little after eight this morning and loads our bikes, still covered in ice and frost, on to a trailer behind his van for the 30 minute drive to Alexandra where we transfer the bikes to a jet boat and head up the Clutha River, mist rising off the placid waters like smoke over a burnt field. 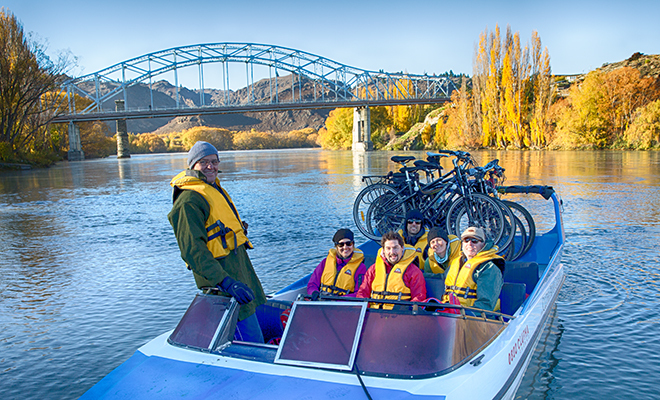 There are no roads along the Clutha River from Alexandra so the plan is for Laurence van der Eb, who owns the jet boat, to shuttle us and our bikes about 10km. up the river to Doctors Point where we will get off and then bike along the newly opened Roxburgh Gorge Trail back in to town. So that’s what’s in front of us. An easier ride than yesterday. But more challenging. Make sense? 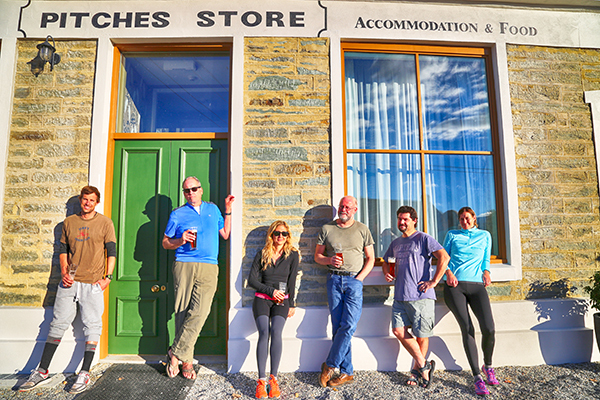 The group in front of Pitches Store in Ophir: Justin, me, Casey, Paul, Michael, and Adriena. Photo by Casey Hatfield-Chiotti. It’s late afternoon before we reach Pitches Store in Ophir. Pealing myself off my bike, I check the bikes odometer: 49.7km.—which doesn’t seem like a terrible lot until you realize that none of it was on asphalt roads but rather rock and gravel and dirt. But we’ve made it, and with nary a flat or breakdown of any kind. Colleen Hurd who, with her husband David, owns Pitches, shows us to our rooms. I am conflicted: Do I want to run a hot bath and just soak for an hour before dinner or get a cold beer from the little bar and sit outside basking in the last of the day’s sunshine? Justin decides the issue for me by banging on my door. “Let’s go have a beer!” he says. Justin steals a couple of homemade ginger cookies from the breakfast room and Colleen brings us frosty Emerson pale ales and we spread out on the wooden table in front of Pitches, talking over the day and enjoying the late afternoon sunshine, the first we’ve seen in three days. I’ll tell you what: a cold beer late in the afternoon always tastes good but when you’ve started the day in damn near freezing temperatures and biked 50km over an old rail trail and now you’re with friends sorting out the day, retelling stories of who did what where, it’s as fine an end to the day as I can imagine. So memorable in fact that, just before the sun sets behind the trees on the other side of the road, I suggest to Casey that we use her tripod to set up a group shot. Something informal, I suggest. Just have everyone stand wherever they want. We look ridiculous, I suppose. Still in our sweaty cycling clothes for the most part: Casey in her gray leggings and orange shoes, Justin with his sweat pants pulled up almost to his knees, and me in my blue cycling shirt and flip-flops. We set the timer and lean or sprawl, happy but exhausted, against the front of the old store. Later that evening when I look at the shot on my computer, it makes me smile. It’s a simple photo of an afternoon, a day, a place in time (“Pitches Store, Ophir, May 2014”) that we’ll all fondly remember. The Rough Ridge hills are the backdrop to our ride through Central Otago. Photo by David Lansing. There’s six of us cycling. We travel mostly in pairs though truth be known, I prefer keeping my own company, which usually means I’m far behind the rest. Every half hour or so one or another of the riders—usually Justin—will circle back to make sure I’m okay. Which I am. Just not in a hurry. It’s something seeing the countryside this way. 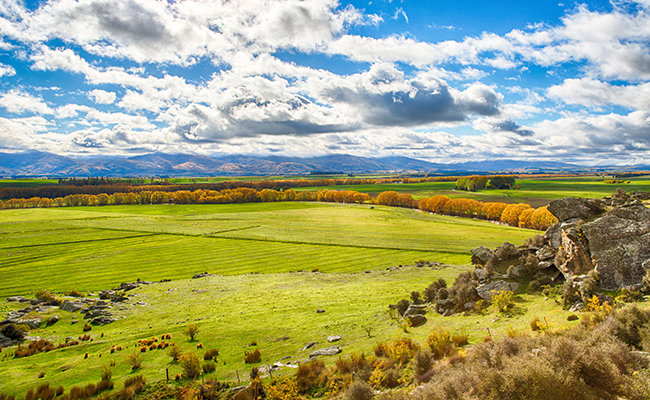 The lime green pastures split by long rows of yellow and orange trees following the winding river and in the distance the bruised humps of the Rough Ridge, the oddly-named range of hills up ahead. There are sheep and cows and every few miles a farm, and that’s about it. Never see or hear an airplane, seldom spot a car. Even other cyclists are few and far between. I might easily ride for half an hour or longer before seeing someone coming in the other direction. We nod at each other, no words spoken, as if both parties agree it would be an injustice to break this cold morning silence. 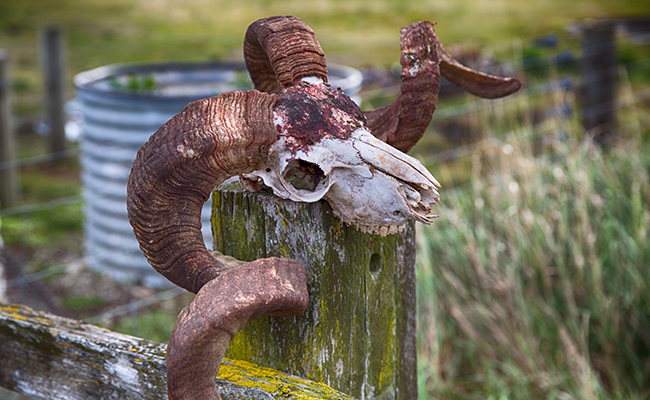 At one point I’ve stopped to take a picture of a ram’s skull on a fence post and Justin rides back to tell me that there’s a little town—Oturehua—nearby and we’re stopping there for coffee. Oturehua is typical of the townships around here. A hundred years ago there was a post and telegraph office, a general store, school, hotel, flour mill, and several taverns. Now only the general store and Oturehua Tavern remain, as well as the Ida Valley Kitchen, where we order our flat whites and long blacks and an assortment of baked goods—chewy muffins and sweet rolls and the like. We take our time. We sip our flat whites and pick at our muffins and watch as a young boy, no more than 10 or 11, stacks bales of hay in the shed across the street. 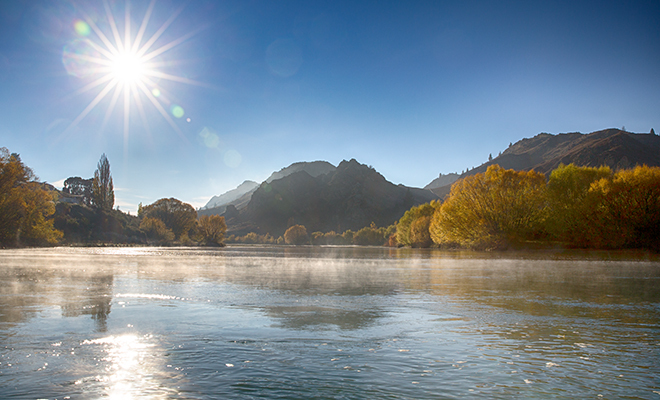 Time slows down in a town like Oturehua. Which is just fine. 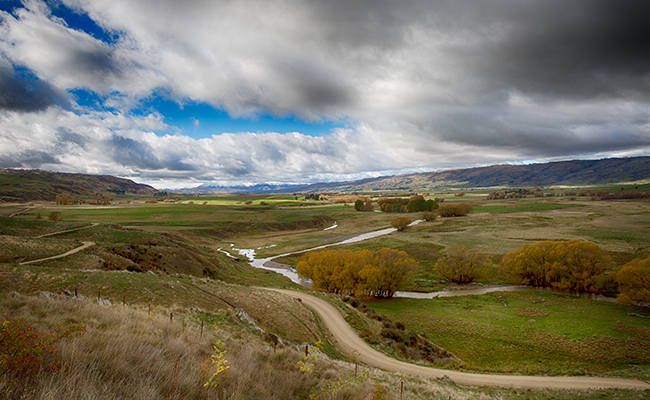 The Central Otago Rail Trail in New Zealand. Photo by David Lansing. Well, it’s morning and I don’t have any wet weather gear and there’s no way I’m cycling 50km over the Wedderburn pass in just my cycling shirt and a light weight sweater. Foolish I’m not. Nev has come through with a well-used rain jacket, heavy and warm, wool hat, gloves, waterproof pants. Zipping up, I look ridiculous. Like a fisherman braving the waves off the coast of Alaska. But I won’t be wet today. And that’s good enough. 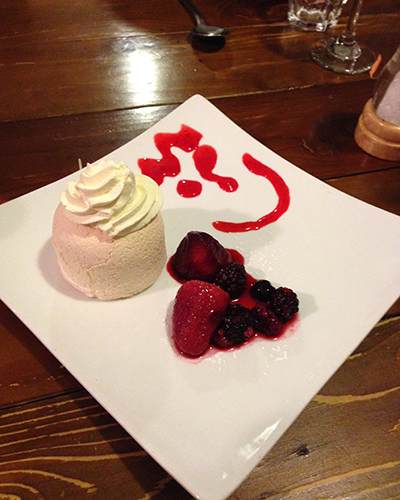 A sort of deconstructed pavlova at the Wedderburn Tavern. Photo by David Lansing. I’m not a dessert guy but I know Justin and Casey (who I call the Juseys) love their sweets so after our dinner at the Wedderburn Tavern, I suggested we get a couple of pavlovas for the table. Okay, here we go: the big who-made-pavlova-first debate. It’s like trying to determine whether pisco was first made in Chile or Peru. Ten years ago, of course, we would have gone round and around arguing about pavlova’s provenance but now all you have to do is pull out your smart phone and do a little cursory research. Point to Adriena (although if I was being peckish I could have pointed out that the Wikipedia entry was probably written by a Kiwi). Good point. And since the Brits have been making trifle since at least 1596, I say we need to give them proper credit. What do you think?